FILE FOOTAGE OF MARGARET THATCHER AND AUGUSTO PINOCHET. 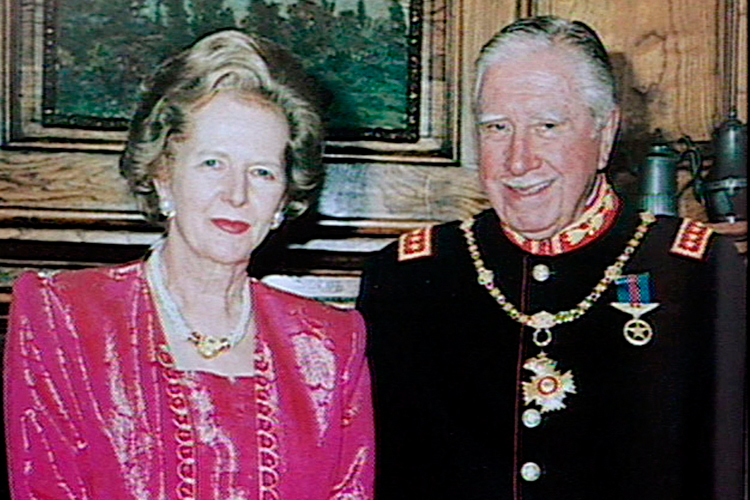 FILE FOOTAGE MAR94 – Lady Margaret Thatcher and former leader Gen. Augusto Pinochet are seen in this file footage taken in March, 1994, during a private meeting in Santiago. Pinochet was arrested in London October 17 while on a visit to Great Britain for medical treatment and is being held under armed guard at The Clinic in London following an appeal for his extradition to Spain to face charges of genocide and torture. Lady Thatcher said that the former leader “must be allowed to return to his own country forthwith” and that “he did so much to save British lives” during the 1982 Falklands War when Chile supported Britain in its conflict with Argentina. 2 Responses to FILE FOOTAGE OF MARGARET THATCHER AND AUGUSTO PINOCHET. Great pic. Just saw it on the Chumbawamba video So Long So Long, you kept me waiting so long. Terrible growing up under Thatcher. In the early eighties aged eleven and twelve at the height of the CND movement and Greenham Common protests I got my school motivated and interested in the campaign. Then came the Falklands with the pointless loss of British and Argentinian lives and I was vilified in the playground called Galtieri. So it was a lost campaign, anger at huge unemployment was swamped by the patriotic deathwish. Is it true that they had refused British citizenship to the falklanders the year before ? What is true is that Pinochet was the first to privatize in his american backed brutal military dictatorship with death camps. What’s also true is that Thatcher and the Conservative Party were amongst the world’s last defenders of apartheid South Africa. I regret having been a bit young to join the miner’s resistance to Thatcher. But proud to have paid no pay tax and contributed to her fall in that way. Anyone else who was as vehemently opposed to Thatcher as me might like the propositions in Leo Abse’s book Margaret Daughter of Beatrice, which explains how she was in fact not a strong woman but was acting out the unresolved difficulties of a severe childhood and unfortunately subjecting the country to them. Leo Abse gave suggestions as to how we could turn politics back towards a more community based caring society and away from the world of selfishness, individualism, money for moneys sake and gambling proposed by Thatcherite politics.